The all-new FIM Enel MotoE™ World Cup is coming soon, with competition in this new category of motorcycle racing set to begin in 2019. This parallel path of racing combines speed and sustainability like never before, with the electric 2019 Energica Ego Corsa ready to get out on track. The motorcycles will all be identical in the Cup, supplied by Energica Motor. What’s more, all the energy stored in the batteries that will power the motorcycles will be produced from renewable resources, a commitment from Enel, the Title Sponsor of the series. Energica Motor Company S.p.A. is the first Italian manufacturer of high-performing electric motorcycles, and the manufacturer of the Energica Ego Corsa on which MotoE™ riders will compete. All motorcyles will be identical although for some parts, like for example the springs, teams will be allowed to choose between a range of different stiffness depending on the rider’s specific needs. Motorcycles will be kept together in a dedicated E-paddock structure, in which each Team will have its own box. Solar Panels will be coupled with Smart Meters, that are measuring equipment to constantly track the electrical energy use of the event. Enel will provide a distribution system that will connect JuiceRolls and the MotoE paddock auxiliary’s loads to the grid, integrating Solar Panels. The result is the complete electrification of the Moto E event, from the grid to the motorcycle. The grid will be composed of 18 riders, including the presence of female rider, Maria Herrera. Split up into 12 different Teams. 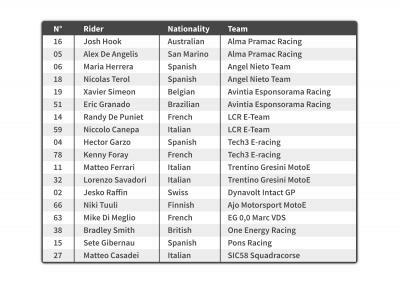 There will be ten different nationalities lining up in the FIM Enel MotoE™ World Cup, from Australia to Brazil including many European countries. Four former MotoGP™ riders including Sete Gibernau (twice MotoGP runner up), former FIM Moto3™ World Champion Nico Terol (2011) from Spain, 125 World Champion Mike di Meglio (2008) from France, two FIM Endurance World Champions like Josh Hook (2017) and Kenny Foray (2014), and a former European Moto2™ Champion, Eric Granado from Brazil. There will be a maximum of two people allowed to work on the motorcycle, plus a rider. The November test takes place alongside Moto2™. • The last event of the season in Misano will have a race on Saturday and a race on Sunday. A rider competing in any Grand Prix class is not permitted to participate in any other non-Grand Prix class at the same event. So MotoE™ riders will not be allowed to race in a Grand Prix class at each of the five dates on the FIM Enel MotoE™ World Cup calendar. Tyre supplier Michelin will be providing one type of front and rear slick tyre and one type front and rear rain tyre per race week-end. The specification may change according the track layout. The number of tyres per specification will be four front slicks and five rears, with an additional three front rain tyres and four rear. Joining title sponsor Enel and motorcycle supplier Energica will be Dell’Orto supplying the datalogger, logistics partner DHL, Michelin and Allianz who were all confirmed as partnering this new parallel path of two-wheeled racing. During the last MotoGP event of the year at Valencia, you will be able to see Energica test team with Loris Capirossi and Alessandro Brannetti on Thursday (12:00 to 13:00 and 16:30 to 17:30) and Friday (12:35 to 12:55), as well as Jorge Aspar Martinez on Sunday before the MotoGP race at 13:25.